Residential Garage Door Repair | Fast, Friendly, & Fair! Need immediate residential garage door repair? If your car is held hostage by a broken torsion spring repair or a garage door off track and you are late to work, we can help! We offer guaranteed same-day service at no extra charge when call is received before 2 p.m. Even if you have a repair that is not an emergency like a dented panel or very squeaky operation, an Aladdin Garage Door technician will arrive at your convenience to resolve your garage door issues and help to prevent future unexpected failures. 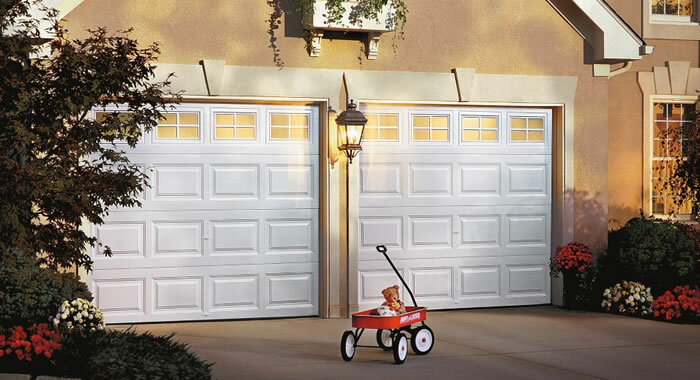 Aladdin Garage Doors Houston is a garage door sales, installation, service and repair company serving the Houston metropolitan area. We specialize in troubleshooting, repairing, and installing residential garage door systems whether it is a Liftmaster garage door opener installation of one of top quality Chamberlain products or the repair of an existing garage door for any manufacturer model. We service ANY garage door system. 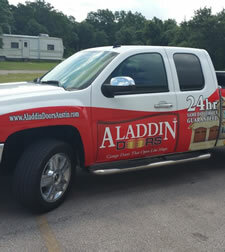 When you choose Aladdin Garage Doors Houston, you’re partnering with a local, family-run business company that is large enough to have trained technicians with background checks who can serve all of your residential garage door repair needs 24/7/365. Because we are a small business, we treat you as if you are our only customer and make sure you’re 110% satisfied with our services. Our residential garage door repair service trucks are fully equipped with all of the parts necessary to repair any type or manufacturer, modelo, or style of garage door system so we can usually complete your repair on the same, on the first trip! Call 281-252-3346 or fill out our contact form on the right to schedule a free estimate to repair or service the garage door in your home or shop.